Swiss Reg. no: 558908 Silicone mat for washing Trays, autoclaves, ultra-sonic cleaners, micro-surgical instruments protection. TRAYS COVER FOR WASHING TURBO MACHINES, FOR ALL INSTRUMENTS, AND FOR WASHING INSTRUMENTS RIGIDE OPTICS. 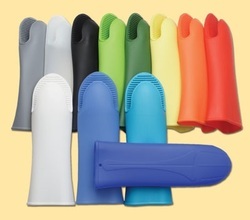 Silicone Gloves that are designed optimized for the demands of medical sterilization. Thermo - resistant from - 60°C to + 300°C , 100% autoclavable, sterilizable and washable. Max Planck Institute of Germany Quality of certification. 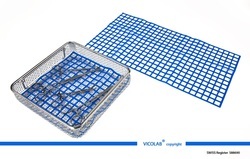 Silicone mat optimized for Micro Instruments on washing trays , autoclaves, ultra-sonic cleaners and micro-surgical instruments protection. 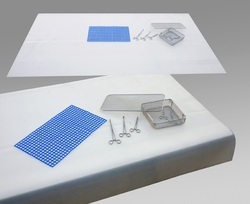 "PROTECTS YOUR INSTRUMENTS AND SECURE INSTRUMENTS IN BASKET FROM FLOATING AWAY ON WASHING PERIOD"
Work Surface Silicone Mat which is ideal for the protection of surgical instruments on the stainless steel work table. This specialized mat protects very sensitive pointed medical instruments and keeps the instruments sharp while also increasing the lifetime of the instruments. There is no light reverberation on the stainless steel worktable because of silicone surface work mat and this situation improves working conditions.